This article was written on 15 Jan 2013, and is filled under art engagement. 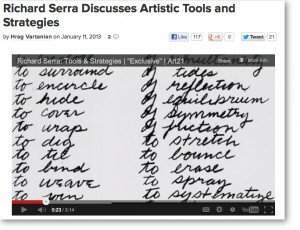 I was watching a short on Art21 (“Tools and Strategies”) with Richard Serra. He was talking about his process and gave a succinct overview of ‘the artist’s process’. I don’t think Serra’s is simply one typology of practice, but rather, it is a model for how to do focused work. It struck me that this articulation could be extrapolated into a variety of exhibits or activities to not only create vehicles for visitors to walk in the shoes of an artist, but as a way to immerse and build confidence in an open-ended form of creativity. Since my visit to Sweden, I’ve been trying to work out how to do that in an exhibit or activity form (ala the Sally Studio Method I wrote about). I also think this is a vehicle for the creative process of exhibit development- given some context and framing. I think I will put this into the hopper for the San Francisco Mobile Museum exhibit in development (Observatorium). 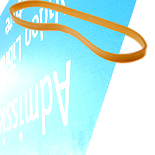 I’d like to mesh the artistic practice with the experiential goals of an exhibit, and see what outcomes can result. I was thinking about this very thing when I read a great piece on Jerry Seinfeld in last month’s NYT. It was fascinating to see behind the curtain to the process and methodology that goes into building a good joke. In the education world, we used to refer to the process as “invisible creativity,” acknowledging the necessity of the amount of behind-the-scenes creativity to produce anything worthwhile. Katie, thank you, that’s a great post, and the Seinfeld analogy is apt. I heard an interview with him along those lines and sounds as if we all share the refinement obsession. Also, I like the fact that many aspects of making these days are getting inverted (or extroverted).